I enjoy candles in the evening, the bathroom and the bedroom. The light flickering with the scents helping to elevate & change moods but what's even better is when they're cruelty free & vegan! These are made with 92% Eco Soy Wax derived from pure Soybean Oil as opposed to paraffin which is the main ingredient in most candles and it's a waste product from the oil industry. There is a lot of processing involved such as bleaching and deodorizing to manufacture the candle wax, once lit it releases carcinogenic chemicals which could contribute to respiratory illness. Scented candles may have lead or lead cores in the wick, which means leads being released into the home through burning! While these are made from a natural cotton wick that are lead free. I'm a citrus nut, it makes me happy, it's comforting so whenever possible I go for the scent for that reason more than anything else, this has Grapefruit Lemon and Cedarwood. The essential oils within this candle are synthetic, I'm guessing like fragrance oil which I burn in an oil burner but I'm not 100% sure but if so, you'd never know the difference from fragrance to pure. Grapefruit a mood enhancing oil that can help with occasional sadness and anxiousness brought on by everyday worries. It can be very uplifting and mood lifting. Lemon oil increases focus and concentration, it'll support the mind when stress or tension arises from everyday issues - it could help anxiousness. Cedarwood oil is high in sesquiterpenes, which helps deliver oxygen to the brain making this scent important for cellular health and brain wellness. 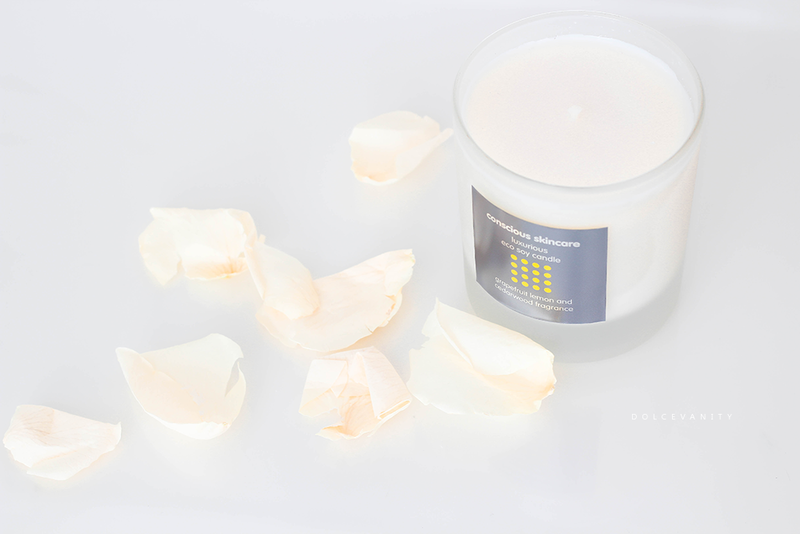 The candle is certainly mood boosting and the combination of clean and fresh citrus with woody cedarwood is a pleasure to have, comforting, relaxing and uplifting all from a candle. This has on average a 50+ hours burn time, which is good considering I may burn it for 3 hours at a time for maximum useage. That candle sounds heavenly, it has been ages since I bought some candles. Now the cooler months are coming in, I need to stock up. LMAO, ah Milly - stock up ASAP haha! There's health benefits which is awesome. I don't even detect any of that smoky burn. Another great post here, loving all these eco finds! Thank you, love that you liked it! Me too, it's another win for the CF & V community lol. They do, don't they?! Even when I blow it out or while it's burning there's none of that smoky smell. Yes it does, I get soy candles from another brand too, rubbish at burning them as I love having loads around at one time. I'm a huge candle fan, this one looks brilliant. I love citrus smells too. If there's ever a doubt on gifts - I think candles are safe options, loads of us love them. These candles sound really nice. It's good to know they are safe and healthy too. Very true, that's a huge bonus - it's something I never really took into consideration before. I have so many candles, but I just love them. I will always buy more! I'm just the same, I seem to always find room and if I never have any around - people are surprised. Didn't know that grapefruits could help with anxiety.. must look into getting something like this! Yes, there's so many great essential oils to help calm and de-stress you. I love the idea of this scent, such a relaxing fragrance. Definitely is, has a lot of great benefits - worth the price tag. I hadn't heard of this brand before but I do love a candle! It's a great brand, I enjoy their skincare products. What a lovely candle nad the citrus smell must make the place smell so fresh. It does especially as it's gentle but the scent is gorgeous. It sounds very luxurious! I love citrus scents, some of my favs! Yeah there's something so calming and uplifting about citrus. candles are so my thing, I love the citrus smelling ones. Candles are just comforting, they set the tone for a lot of occasions. I love burning candles I find it quite relaxing to watch them and also love the scented ones. This one sounds great. It is relaxing to watch them, I agree. Seeing the flame flicker and the shadows around the room. I love environmentally friendly candles. Neom is a favourite of mine. Mine too, they're one of the best luxury candles. We are massive candle fans - so many of them do not have a strong enough scent though. 50+ hours burn time is great value. Some don't, this smelt straight out the box, while burning I find it gentle. It's a great time for burning. Yes, lemon oil is amazing. Essential oils are in general. Oh I love to burn it first thing in the morning and night, gorgeous.